Back when I turned 50 I decided I should indulge myself somewhat with a trip to Las Vegas. And for each 5 year “milestone” after that, to cross some places off my Bucket List. So, for my 55th birthday, it was off to Indonesia to visit Krakatoa and Komodo. I met up with my daughters Skye & Jenny, and Jen’s husband Dave, in Jakarta. I had pre-arranged an overnight camping trip to Krakatoa through a chap named Thom. His website is Krakatau Adventure. He did a great job with the logistics at a reasonable price and I highly recommend his services. The drive from Jakarta to Carita took about 3.5 hours. We stayed overnight in Carita then set off by dual-engined speed boat the following morning. The sea relatively calm thankfully (I’m not much of a mariner!) and after about 90 minutes we arrived at Rakata, an island that is a remnant of the huge 1883 eruption of Krakatoa. We spent some time snorkelling on a coral reef, followed by a picnic lunch on the beach. Part way through lunch we were joined by a couple of good sized Asian Water Monitors, one of which was a little too fearless! Nevertheless we enjoyed their company. In the early afternoon we continued our journey by the same speed boat to Anak Krakatau. Anak means “child of” and is the island that formed after 1883, rising above sea level in 1927. It continues to grow, erupting every few years. We thoroughly enjoyed exploring the island with one guide while the other crew members set up camp and prepared dinner. Towards late afternoon we climbed the volcano as far as the first ridge – it’s not safe to go any further really. An awesome sight, accompanied by a beautiful sunset. Dinner was excellent (apart from the ants and flying insects!). We strolled along the black sand beach at night and sat by a small camp fire on the beach afterwards, before retiring for the evening. It was a bit of a long night – quite hot inside the tent and the ground was a little too hard for my back. In hindsight, bringing an air mattress would have been an excellent idea! We were up before dawn, had a refreshing morning swim and watched the sunrise. Beautiful. At breakfast we were joined by yet another Asian Water Monitor! This one was even bigger than the ones we’d seen the previous day on Rakata. He was close to 2 metres long – a very handsome and majestic fellow indeed. After packing up camp we boarded the boat, again this time stopping for some snorkelling at a spot where a recent lava flow has reached the ocean. The water was fairly clear – not heaps of marine life but interesting nonetheless as the water kept changing temperature! There were obviously some hot spots somewhere down in the depths. After our snorkel we circumnavigated Anak Krakatau in the boat before heading back to the mainland. Road traffic was terrible and we didn’t get back to our hotel in Jakarta until the evening. By gosh the hot shower and soft clean bed felt good that night! Next morning we flew Lion Air to Bali then Wings Air to Labuan Bajo in Flores, the jumping off point for Komodo National Park. We enjoyed a lovely authentic Italian lunch in town before setting off by slow-boat for Kanawa Island, which was to be out home for the next 4 days. And what a beautiful spot Kanawa turned out to be. The accommodation was very simple and inexpensive, but the real treat was the island itself. Surrounded by coral reef and clear calm waters – a snorkeller’s dream come true. 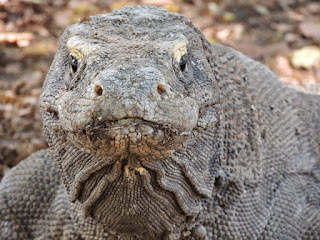 We did a full day trip to Komodo National Park and I was so happy to finally see Komodo Dragon’s in the wild, something I’ve wanted to do since I was knee high to a grasshopper. And if that wasn’t enough, the day-trip also included swimming with Manta Rays! What an awesome experience that was too. 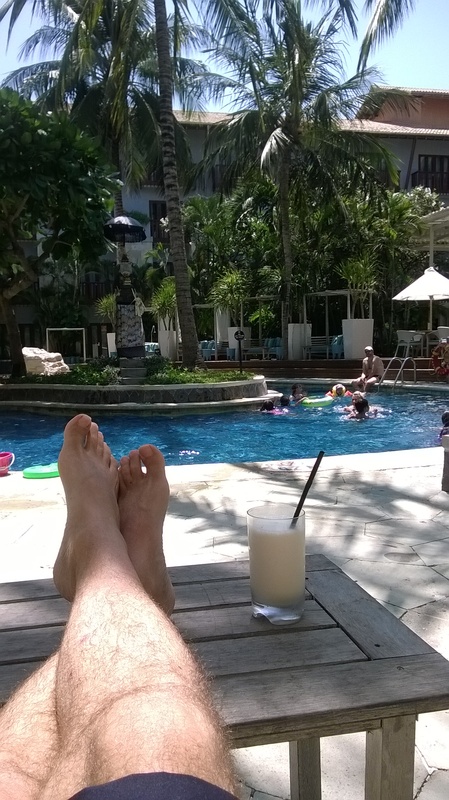 Final stop for the trip was a couple of nights at the Hard Rock Hotel in Bali. It certainly felt quite luxurious after the rustic nights on Kanawa. And the food was excellent!